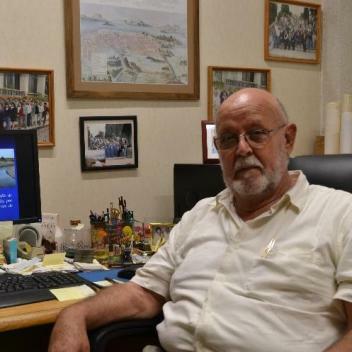 We are saddened to report the passing of Francisco Suárez Vidal, a long-time friend, colleague, and alumni of the San Diego State University geology program. Francisco’s work with Gordon Gastil in the mid-1960’s, while still an undergraduate student at the Marine Science School in Ensenada, was an important pioneering collaboration that helped established rich scientific exchange between institutions and investigators in Ensenada and San Diego. Francisco went on to study for his M.Sc. at SDSU with Pat Abbott and joined the Center for Scientific Research and Higher Education at Ensenada (CICESE) in 1977. He played a leading administrative role in the earth sciences at CICESE while enjoying productive scientific collaborations with many SDSU faculty and alumni including Tom Rockwell with whom he worked on the paleoseismology of northern Baja California, as well as work with Mike Walawender, Dave Kimbrough, Eric Frost and Perry Durning. Francisco’s quick wit, warm heart and strong intellect will be sorely missed.